Invest in energy efficiency: How bundling lots of small improvement projects can be profitable. Wall Street’s new strategy for investing in good deeds. 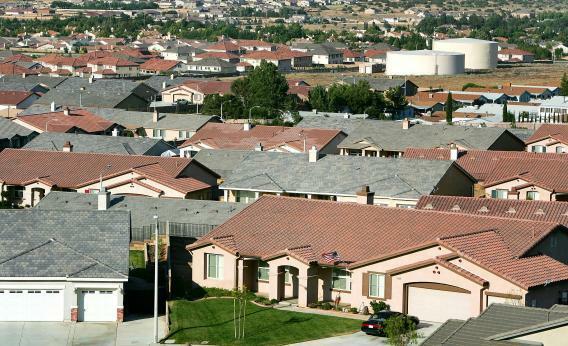 Housing tracts sprawl out near Palmdale, Calif. Photograph by David McNew/Getty Images. If you’re a geek for gadgets that help you live more energy efficiently, this is a glorious time. Never before has the market so overflowed with cool new kit designed to cut the amount of juice you use—for a premium price. There are LED bulbs light years ahead of Edison’s incandescents. There are windows that darken automatically as the sun sweeps across the sky. There are sleek, smart thermostats that monitor your daily activity and adjust your home’s systems to provide only as much heating and air conditioning as the electronic brains determine you need. Slick as they are, these devices aren’t yet making a meaningful dent in the nation’s energy consumption or in its greenhouse-gas emissions. That’s because they’re not being deployed at a large scale. Most Americans aren’t geeks for energy-efficiency gadgets. If they’re aware at all that these devices exist, they’ve decided they’re not interested in buying them—even though, over time, lower electricity bills more than pay back the extra initial expense. There is, in short, a gap between what technologists are selling and what consumers are buying. That gap has big environmental costs, given the vast amounts of energy the United States wastes each year through leaky buildings and inefficient machines. Now, a growing cadre of savvy investors is betting there’s money to be made bridging that divide. They’re designing complex financial instruments to bankroll energy-efficiency improvements in houses and other buildings across the country. And they’re setting themselves up as the middlemen. This is a potential energy revolution of the back-office sort. It’s about developing new business models rather than developing new metal. It’s wonky, opaque, and largely untested. It’s just beginning, and it still could fizzle, because scaling it up would require resolving a thicket of thorny technical and financial questions. But if it works, it could make some investors a lot of money. And, theoretically at least, it could do more for the planet than a roomful of futuristic energy-saving devices that sit, sparkling and unused, on a shelf. Steven Vierengel, a Citigroup director and Wall Street veteran, is among the pinstriped new promoters of this energy-efficiency push. For some 15 years, he has worked at Citigroup securitizing debt, on everything from cars to industrial equipment. The drill: Citigroup finances pools of loans from the original lenders, slicing up the loans based on their different levels of default risk and then reselling the slices to institutional investors. Everyone gets a piece of the action: The original lenders receive new cash to make more loans; the institutional buyers earn interest; Citigroup gets a fee. Few people doubt the opportunity. For years, studies have concluded the economy is groaning under the weight of energy inefficiencies that, if fixed, would pay for themselves through reduced energy costs. In the insiders’ parlance, energy efficiency is the “low-hanging fruit” that, if picked, could provide for a more economically and environmentally sustainable energy system. Creative financiers have tried a variety of financial tools to snag more of the fruit. In one of the more common approaches, contractors known as energy service companies guarantee commercial clients set reductions in energy use if the clients buy new energy-saving equipment. But those deals have focused on governments, schools, and hospitals—big, centralized energy users where the energy efficiencies are relatively easy to pick. The residential sector—which is massively more fragmented but, studies say, offers a collectively greater opportunity for energy-efficiency upgrades—has gone largely untouched. Those who have attempted to finance residential energy-efficiency improvements in a big way have had a tough go. In a particularly ambitious attempt, launched in 2008, laws have been passed in some two dozen states allowing governments to slap an additional levy on the property-tax bills of homeowners or commercial-building owners who want to upgrade their property to make it more energy-efficient. The owners take out a loan for the cost of the project; the money they fork over through the added levy goes to repay the loan. But other market players have cried foul. In 2010, the Federal Housing Finance Agency, which regulates Fannie Mae and Freddie Mac, the home-mortgage packagers, protested that the residential portion of the program put taxpayer-backed mortgages at risk. Its reasoning: Property taxes generally must be repaid before a mortgage when a house is foreclosed. Advocates of the program disagree, and the fight continues before regulators and in the courts. But it has stunted the program’s growth. Wall Street now is considering more advanced approaches. One is to amalgamate money from institutional investors, such as unions and pension funds, into managed funds that would bankroll energy-efficiency upgrades at buildings across the country. The funds then would become, in essence, energy middlemen for the buildings. The owners of the buildings, in return for the upgrades, would pay the funds an agreed monthly amount based on the buildings’ electricity use. The banks’ bet is that those fees would outweigh the banks’ costs: costs both for the new equipment and for the reduced amount of electricity that the banks would have to buy from the local grid to keep the lights on in the newly energy-efficient buildings.